The Care Home Owner employed M+B Morgan Ltd. to undertake an independent hydrogeological survey (a prognosis) which is an essential requirement before any drilling commences. The survey provides an indication of the underlying hydrogeology – detailing the nature of the ground to be drilled, the likely depth at which water will be found and an indication of water quality, enabling the borehole design to be properly specified. Whilst the prognosis is not a guarantee of success it will highlight any potential areas of risk at an early stage. The information from the prognosis report enabled us to produce a more accurate estimate of the projected costs prior to any further commitment from the client. The associated works involved maintaining the mains water as a back-up to the private water supply so that the care home would never be without water. 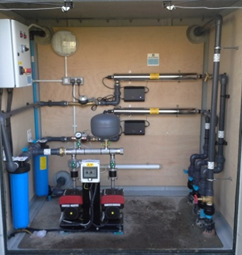 In recent years the water industry has become aware of an increasing level of alternative supplies, like boreholes, and the system must be correctly designed and installed, and be adequately maintained. 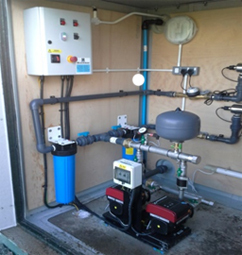 This can only be achieved through the installation of a Type AB air gap to separate the mains water supply and the alternative water system. The British Standards have published documents on alternative supplies i.e. 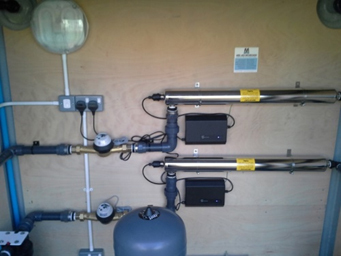 boreholes as an alternative supply which is BS8525-1-2010. 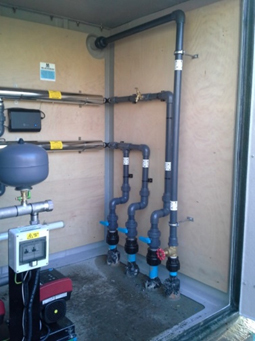 Once the client gave us the approval to proceed, the total system design was considered before drilling the borehole and the installation of the equipment. To improve the standards of the borehole supply, the following key points of the installation are highlighted. Borehole enclosure is a non-degradable GRP cabinet which prevents ingress of rain water. Pre insulated enclosure with 50mm insulation. Unit colour can matched to any RAL colour for customer requirement. Size of GRP can be customised to each installation if required. 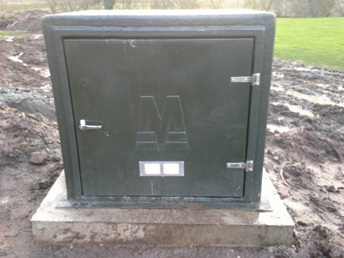 Each enclosure is lockable.Adjustable ventilation to allow installation to breathe. Extended lip for securing down and sealing against concrete. Extended concrete pad 150mm above ground level. Installation protected against UV damage, overheating or freezing. An additional frost watcher heater can be added. Isolation point for customer maintenance. 5 Micron pre filter before storage tank. System pressure indicator for maintenance records. Well cap glued to well casing complete with gasket, waterproof glands and fittings. Borehole raised a minimum of 150mm above floor level. Borehole completed to industry “best practice” standards & fully grouted to prevent ingress of surface water. Easy access for ongoing maintenance. Labelled flow direction and type (borehole). Our contact details for future backup. Added frost protection to prevent freezing. Two 5 micron pre filters prior to Ultra Violet sterilisation unit. UV protection for bacteria control. 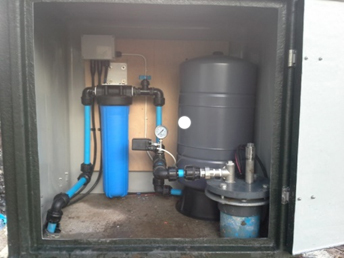 Mains water backup in case of borehole pump failure. AB compliant water storage tank. Documentation for all equipment, including customer training.